If brushing your teeth seems like a menial task, imagine how uninterested your children are when it comes to good dental hygiene. However, we all know how important it is for them so we’ve come up with a few fun ways to entice (trick?) your kids to brush their teeth! 1. You Brush Your Kids Teeth and they Brush Yours! Your kids want to be involved, but a lot of times they are going to be resistant. 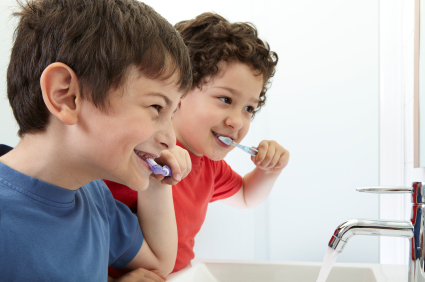 A fun way to keep them involved is to let them brush YOUR teeth, and then brush theirs in return. This way, your kids feel useful, are having fun, and end up with a set of brushed teeth. 2. Use a toothpaste that tastes good! These days you can find a toothpaste in every flavor under the sun. Everything from bubblegum, to grape, to bacon flavored toothpaste can be purchased. You probably know what your child likes by now, and while bacon toothpaste may be a stretch, you can’t go wrong by giving your kid a toothpaste flavored like their favorite fruit or candy. Just make sure it’s flouride-free, because they will end up swallowing some! There’s nothing kids like more than an opportunity to stay up past their bedtime. As a parent, you can use this as an incentive for your children to brush their teeth. If their usual bedtime is 9:30, tell them if they brush their teeth before that, then they can stay up with you until 9:35 or 9:40.